Mountain View Dental is proud to host Dental Student Externs enrolled in the University of New England (UNE) College of Dental Medicine. Dr. Brewster and Dr. Weber have qualified as Preceptor Adjunct Professors in the program. Qualifying is rigorous, with coursework and visitations, both UNE to our site and visits to their campus. Our doctors oversee each student in the office, performing all aspects of clinical general dentistry. They are senior dental students completing their studies in the field prior to graduation. Students arrive for 3-month rotations, which we began here in June 2016, with the first official class of dentists to graduate from UNE. The externs are proving to be a delight for the doctors, staff, and our patients! 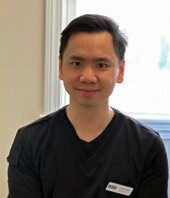 Meet our current Dental Extern, Keith Hau! Keith is from Vancouver, BC, Canada and is seeing patients in our office through the end of April. We offer discounted treatment with our dental students - call for your appointment today!